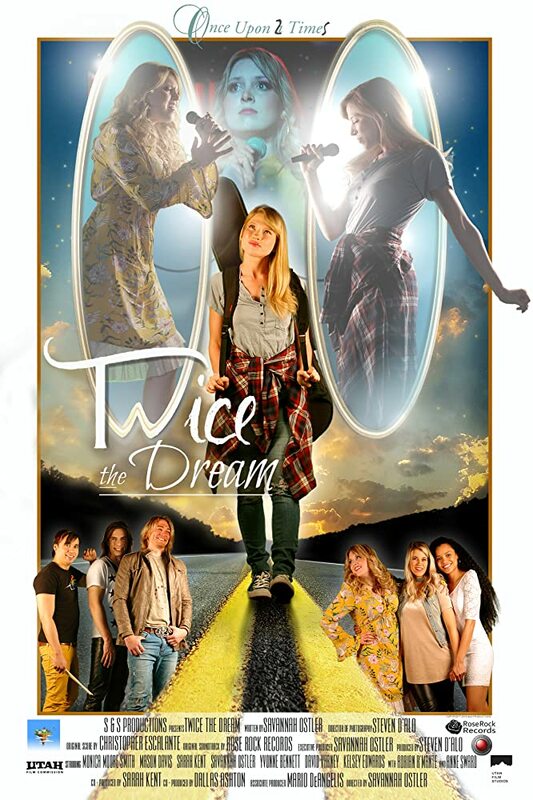 "Twice The Dream" is an inspiring family drama about two sisters following their musical dreams together. Just as the sisters begin to discover their wings and take flight, a sudden family tragedy strikes. In the aftermath of tragedy, they discover that their dreams were the only thing that held the family together. 1. How was it to write and direct your first feature film, Twice the Dream? A: It sincerely was a dream come true, in every sense. The cast and crew were all so incredible and really put on their "A" game. At the end, we all felt like family! Some of us of course, literally being family. ;P Haha and by that I mean, my husband was one of the producers, and was also the director of photography. My mom is amazing at art and making props, so she was in charge of the art and prop department. A lot of my lifelong friends helped as well, and my brother. So it truly was a dream come true making the movie I love, with the people I love. It was nothing short of magic! 2. What were some high points during the creative process? A: There were so many high points, everything from writing the screenplay, to setting up that perfect shot. When writing the script, there seemed to be something so special about being so into the story, and so sucked into that world. But, as soon as we got on set, it was incredible to see those characters and scenes come to life. I would say that was a high point- seeing these characters come to life, living, breathing, and interact with each other. It was really fun working with the actors as well, and collaborating with them. The cast truly understood their characters- just as much as I do. Sometimes, maybe even more. A few of the actors would come to me with some ideas, or thoughts on scenes, and their character's journey, and sometimes would suggest certain lines of dialogue. 9 times out of 10, we were always on the same page, and I let them go for it. It was soooo cool seeing this! 3. What was your favorite scene on set? 4. Any learning moments you want to share? A: Making this film has been a long journey, and throughout that journey, I have learned so much. Ultimately, I think that one of the most important things that I have learned would have to be to just trust myself and the stories that you want to tell. Along the way, a lot of people will try to discourage you- and that's just life. Just because someone else doesn't particularly get your vision, doesn't mean that it's not good. If you have a story that you want to tell, then you need to tell it. Don't let anyone else tell you otherwise. 5. What inspired you to tell this story? A: Growing up, I realized that there weren't a lot of inspiring, feel-good coming of age movies. Movies that I really wanted to see at that age, stories that I could relate to. It was always such an underserved market. (For the record, these types of moves aren't only limited to that age group, because I still want to see these kind of movies. They are for the young at heart. So, at the tender age of 14, I started writing my story, "Twice The Dream". Something about this particular story had set my soul on fire. The characters had absolutely consumed me, but in the best possible way. I knew it was my mission to get this story told through film. I could hardly think of anything else! 6. How is it being a female in the film business? A: Being a female in the film industry is definitely tough. At times, it really seems that all of the "suits" in Hollywood making the decisions are men. I sat in many meetings like that. They would be interested in my story, but they would insist on making certain changes- changes that would change the very heart of the story. Although these offers were sometimes tempting, I would resist, remaining stubborn. I've even been called a "B" word because of this. But you know what? I think it's necessary. As women in this industry, we have to stick up for ourselves. Luckily, I think this is changing. Slowly, but at least we are getting somewhere. People are starting to realize that half of the population are women. And as such, I think it's safe to say that we know what a large portion of the population can relate to in film. Together, we are changing this. 7. What advice would you give to aspiring filmmakers? My number one piece of advice is to stick to the story that you want to tell. Don't let any "suit", or colleague, teacher, or even a family member try to convince you otherwise. You're set on the story you want to tell? Great! That's the one you need to go with. Because as we all know, making a movie is hard work. So you have to love your story so much, that you would be willing to go on this journey with it. And another thing... never give up. 8. Do you think your experience as an actress helped in directing other actors? Why? A: I absolutely think it helped. Truthfully, I believe my experiences as an actress have helped me as a writer as well. Since I'm familiar with the actors process, and the way actors think, I found it fairly easy to convey direction to the cast. And they always took that direction so well, and would totally understand where I was coming from. We were always on the same page! 9. What is your next step with Twice the Dream? A: We are knee deep in post production right now, finalizing the sound mix, original score, color grading, etc. It's been a fun but long process in itself, but I feel like I've learned a lot. We are currently exploring different distribution options. Looking for the right partner! Our goal is to release it theatrically first. (Even if it's a limited release) Following our theatrical run, we plan to release it on various VOD platforms such as Amazon, Netflix, Hulu, etc. 10. Do you have any other projects on the horizon? A: Oh, most definitely. Since I'm crazy, I'm currently writing two different scripts- both female driven like Twice The Dream, but very different genres. One is a thriller and the other is a fantasy. I also am still working on my YA fantasy novel series and re-launching that. 11. How did you finally get to make your movie? A: I know the reason that I was able to achieve this dream is because I have been so fortunate to have such amazing support from my family and friends. They always have kept me going, and amazingly enough, they were the same people that saw my dream to the very end. Dreams are important, but I know it's hard. There are days, sometimes months when you feel like your dream might be impossible. At times, it can feel like the whole world is against you. During the pursuit of my dream, there were times when it felt like I was going nowhere. Sometimes, it was very painful. Blood, sweat, tears, and many other losses went into this pursuit. I would then ask myself, "Is this pain really worth it?" There were many times when I felt like I had absolutely hit rock bottom, and that my dream may never come true. BUT.... Yes, that's a "but" Here is the important part: I refused to give up. No matter how long it took, or how hard it was. This dream was too important to me. And I remembered why I had been holding on for so long. Moral of the story is: NEVER, EVER, EVER GIVE UP. Period. Dreams come true, even if it takes over a decade.